Traditionally, bad teams throw the ball more than good teams. It might seem a bit odd considering the success that pass-heavy teams have had in the last decade, but good teams with pass-oriented offenses tend to build big leads and thus run the ball more in the 2nd half to chew up clock. Conversely, bad teams might be run-oriented but end up throwing a lot more than they run since they are playing from behind so frequently. The 2007 Patriots are a great example of this. Tom Brady, Randy Moss and company are remembered for a high-octane passing attack. However, you might be surprised to know that they threw the ball less than 1% more than league average. Over the course of the year, the Patriots called a pass play 57.4% of the time. League average in 2007 was 56.5%. 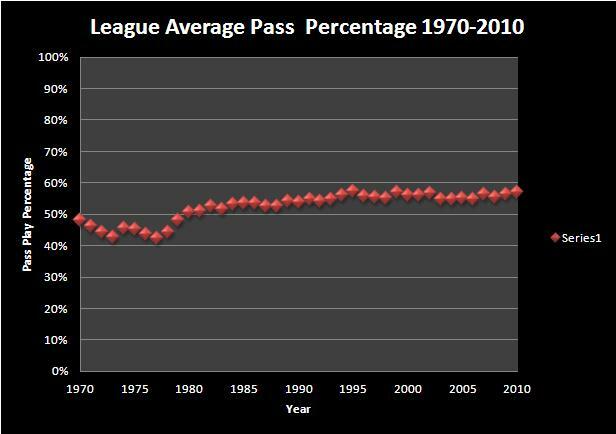 2011 could have been that year, it had the 2nd smallest difference between playoff team pass % and league average – despite the 3 most run heavy teams in the league all making the playoffs. In fact, those three teams (San Francisco, Houston, Denver) are the only three teams who ran more than they passed. It looks like 2012 could be the first year in NFL history where playoff teams pass more frequently than non-playoff teams. Although, as you’ll notice in that graph, every time it gets close to happening, the playoff teams start to a bit more towards the run for a few years. At his current pace, Welker will end up with 120 catches for 1662 yards. Certainly a great season – it would land Welker at 8th overall. In order for Welker to top Rice’s 1995 yardage, he will need to average 141.2 yards per game from here on out. That seems very unlikely, even with the Patriots’ cushy schedule down the stretch. Most likely, Welker will end up with an impressive (but not record breaking) 1500-1600 yards. As you can see, today’s offensive scoring is on par with what we saw for most of the last 30 years and only a little higher than the 1970’s. If the NFL had a “dead ball” era, it was the early 1990’s where offensive scoring dropped from 18.7 PPG in 1990 to 17.7 in 1991, 17.04 in 1992 and 17.9 in 1993 before jumping back up to 19.0 in 1994. 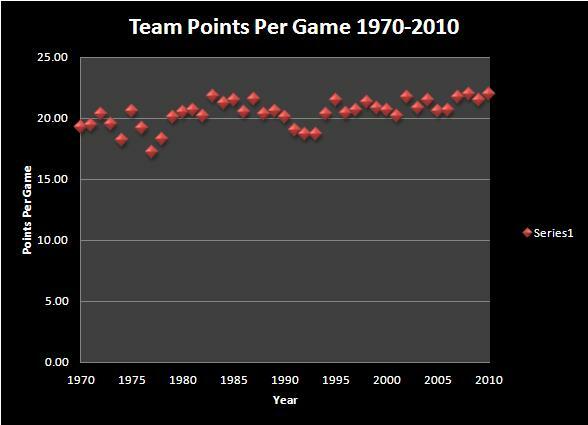 A similar drop occurred in 1977 when scoring when from 18.3 PPG to 16.0. 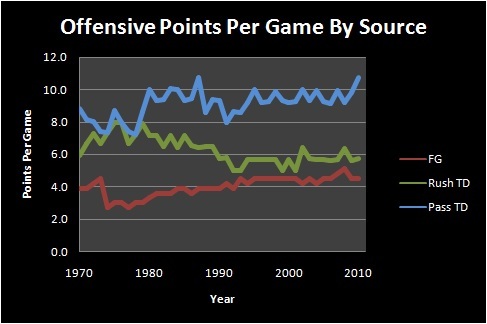 Each line represents the average number of offensive points per game by source of score. What happened in the early 1990’s was a one year drop in pass TD. In 1990 each team scored an average of 9.3 points off passing TD’s (and extra points) and 6.5 PPG from rushing TD’s. In 1991 that dropped to 7.9 passing PPG and 5.7 rushing PPG. The next two years saw passing TD’s rebound, 8.6 PPG in both 1992 and 1993 but rushing PPG fall to a mere 5.0 PPG (both years). In 1994, things normalized again, passing PPG jumping to 9.2 and rushing PPG to 5.7. Rushing PPG has only gone over 6.0 twice since 1990 (6.3 in 2002 and 6.4 in 2008). While this is being called the “Year Of The QB” (with some merit to that claim), passing TD’s are down from last year – and that’s before the harsh weather starts setting in. 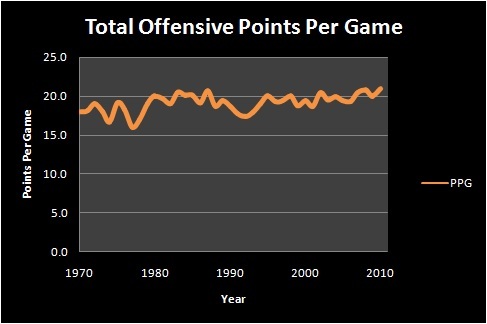 So, while the media plays up the offensive “explosion” we have seen this year (and in the last 2-3 years), overall offensive scoring hasn’t seen too much change in 30-40 years other than a few isolated short periods. Is Trent Richardson The Last Of A Dying Breed? Good size, good speed, good vision and power – Trent Richardson has virtually everything a team looks for in a starting runningback. 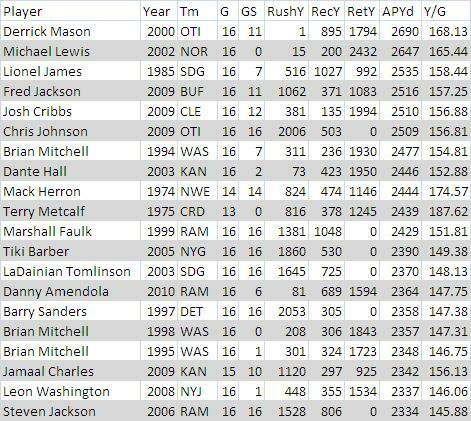 Assuming he declares, Richardson is a good bet to be a top 10 or even top 5 pick in the 2012 draft. As talented as Richardson is, some people think that the success of low round and undrafted RB’s is making it increasingly difficult to justify using a high draft pick on a runner. After all, each of the last two Super Bowl champions heavily featured guys who were no-names coming out of school. The 2010 Green Bay Packers used 6th rounder James Starks as their main guy in the playoffs and Super Bowl. The 2009 Saints used undrafted players Pierre Thomas and Mike Bell more than former 2nd overall pick Reggie Bush. There is a new prevailing wisdom amongst many draft experts and NFL talking heads: the days of RB’s going early in the draft are coming to an end – evidenced by Mark Ingram being the only 1st round RB in 2011 and he didn’t go until 28th overall. Is this really true though? Is Trent Richardson one of the last 1st round RB’s we’ll see? The success of the 2009 Saints and 2010 Packers, as well as Arian Foster (undrafted), BenJarvus Green-Ellis (undrafted), Peyton Hillis (7th round), Fred Jackson (undrafted), and Ahmad Bradshaw (7th round) is used to support the notion that low round or undrafted RB’s is the new trend. Of course, this ignores that the two most recent Super Bowl losers each selected a RB in the 1st a few years before reaching the Super Bowl. (the Colts’ Donald Brown and the Steelers’ Rashard Mendenhall). Additionally, the last 5 years has also seen plenty of elite-level production from 1st round RB’s like Adrian Peterson, Darren McFadden, Thomas Jones, Jonathan Stewart, Chris Johnson, DeAngelo Williams, Steven Jackson, Cedric Benson etc. As you can see, the number of playoff teams which are extreme pass-heavy teams (60%+) hasn’t really changed all that much since the mid 90’s. So if in general teams aren’t running less than they were 10-15 years ago, and playoff teams aren’t running significantly less either, why has the running back position fallen in value in so many people’s minds? 2011 was the first year since 1984 where we saw only 1 RB go in the 1st round but there have been plenty of 2 RB draft classes. There were more 1st round selections used on RB’s between 2008-2010 than 2005-2007. In turn, 2005-2007 featured more 1st round RB’s than 2002-2004. It looks to me like Ingram and the 2011 draft class was an anomaly more than an indicator that teams will be less likely to select a RB going forward. 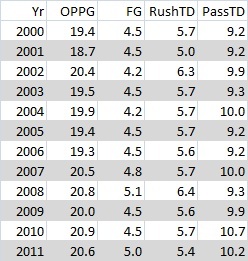 It could just be that 2011 was an unusually weak class at the top for RB’s. Or maybe the lack of 1st round RB’s was related to the strength of different positions in the draft – pushing otherwise fringe 1st round RB talent into the 2nd. These types of things happen: 2008 there were no 1st round WR’s. There was no 1st round QB in 1996 and in 1997 the only 1st round QB was Jim Druckenmiller who went 26th overall. What seems to be happening is that fewer teams are going with a “feature” back. Between 2007-2010 only 45 RB’s had 250+ attempts in a year, compared to 67 in the prior 4 seasons. This has correlated with something of an increase in guys with 150-249 carries. So the average draft follower might think “why use a 1st rounder on a RB who isn’t going to be more than a part time player”. However, the multi-back system is something we’ve seen before – the late 80’s through the mid 90’s had a similar lack of “feature” backs. And throughout all those years, 1st round selections were used on RB’s. The mutli-back backfield trend is real (although not new), but its effect on the likelihood of a 1st round RB is probably minimal. The “demise” of the 1st round RB – if it is a real phenomenon – is likely a result of something which has nothing to do with the RB position at all: the new rules which have opened up the passing game. 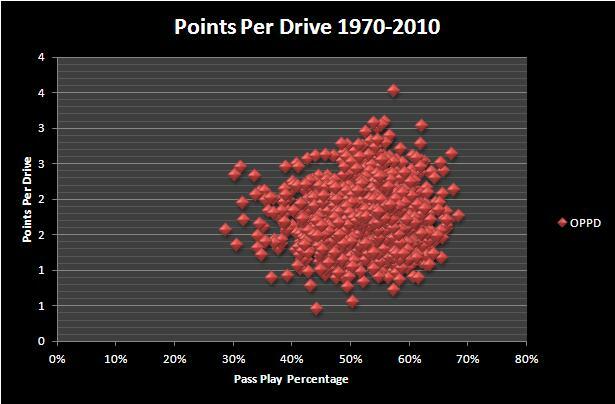 Teams aren’t necessarily passing more frequently, but they are passing more effectively. Therefore, there has been an increase in the demand for pass-rushers and defensive backs in an effort to slow down these more efficient passing attacks. If we see fewer 1st round RB’s in the next few years, it is likely because teams are trying to find ways to slow down the elite QB’s in the league, not because teams have decided that good RB’s aren’t worth taking early. What do you think? Is Trent Richardson – or any top RB prospect – worth a top 10 pick? Will we see fewer and fewer 1st round RB’s going forward? What other running backs are worth of 1st round consideration in April? As you can see, the increase in points per game doesn’t exactly follow the increase in passing, most noticeably between 1990-1995. 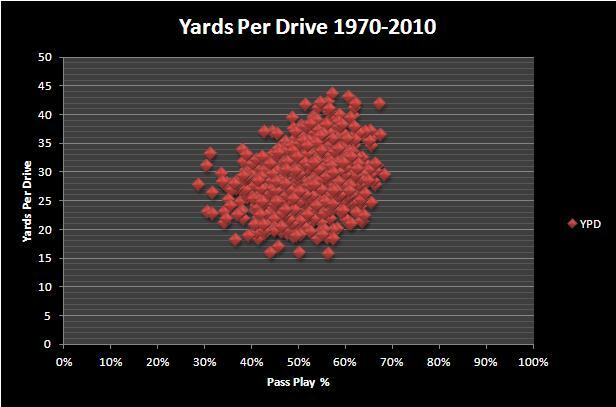 Over the last 40 years, offenses which pass more than they run tend to generate more yards per drive (YPD). 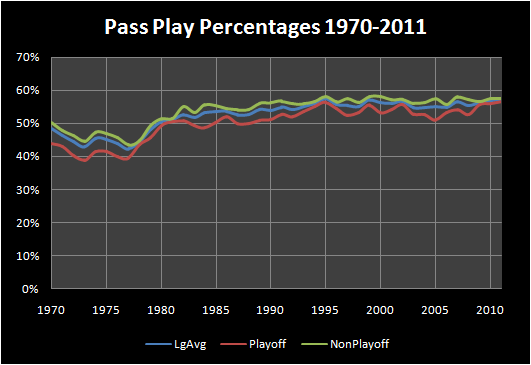 Which makes sense since the average yards-per-attempt is higher for pass plays than it is for rushing plays . In 2010, the average Net Yards Per Pass Attempt [(pass yards-sack yards)/(pass attempts+times sacked)] was 5.7 and the average Yards Per Rush was 4.2. There’s an interesting mix of offenses here. 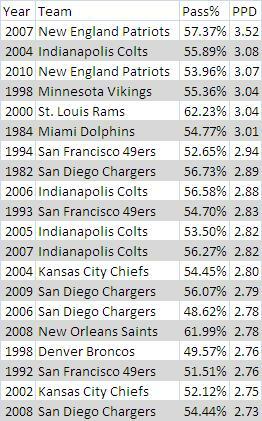 The 2006 Chargers and 2008 Saints had identical PPD but San Diego threw the ball 13.37% less frequently. Four of the top 5 threw the ball less than 60% of the time. There are a couple things which are going on here. First, teams which score a lot of points tend to run more towards the end of the game to chew up clock (as many of those teams would have built large leads). So they may throw 60% of the time in the first 3 quarters and then run the ball 70% of the time in the 4th quarter. Conversely, teams who don’t score as many points are probably more often in the position where they have to throw a lot to catch up in games – thereby inflating their pass% slightly. Later this week, I’ll take a look at defensive performance and see if there is any tie between a team’s defensive efficiency and their offense’s pass/run ratio. Darren Sproles: Greatest All-Purpose Threat Ever? 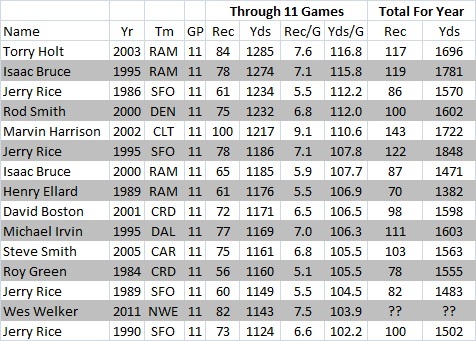 Thus far, Sproles’ yards-per-game pace is fourth best all-time. What’s especially impressive about Sproles’ pace is that he’s on track to get over 500 yards rushing, 500 yards receiving and 1,000 yards returning – something which has never been done. One year wonder Lionel James is the closest; his 1985 season being perhaps the best “all purpose” season in the truest sense of the word. Despite his great 1985 season, James never topped 700 all purpose yards in any of his 4 other seasons. If the Saints’ diminutive running back can keep up his pace, he could be considered the best “All-Purpose” threat of all-time. To top it off, Sproles is putting up these numbers despite the new kickoff rule. Were kickoffs still at the 30-yard line, Sproles’ numbers would likely be even more impressive.